Description: This is how the engine looked before it was brought to PA. Title: RBMN #425 as GM&O 580. Description: The 425 with a dead-centered headlight after is was acquired by Paulsen Spence, still carring the #580 from the GM&O. Description: The first change to the 425 after Paulsen Spence bought the engine from the GM&O. Description: Digital image from Kim E. Piersol original 35mm Ektachrome transparency. Phoenix Lumber Co., Phoenixville, PA. Sortly after she ran on the Valley Forge Scenic Railroad. Originally Gulf, Mobile & Northern G-1 Pacific. Ran the Blue Mountain & Reading tourist line in the 1980s and 1990s. 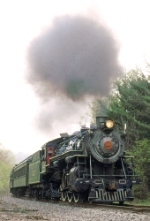 Now on the roster of the Reading & Northern in Port Clinton, PA. Description: 722 Under steam with 425 and 58 keeping her company. Description: Fresh from rebuild, No. 425 pulls the third Shoppers Special from South Hamburg to Philadelphia. 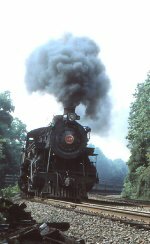 Description: Blue Moutnain & Reading 425 ran a couple of Hoboken-Port Jervis trips the weekend of Aug 2 and 3 1986. The Saturday trip is passing the new station at Harriman. Description: Andy Mullers ex GM&N 425 ran a trip from Hoboken to Port Jervis on the rainy day of August 2 1986. There are no turning facilities in place at PO by this time, so the train ran behind a pair of M&E Alcos, while the 425 was turned on the wye at Campbell Hall, and run backwards to Port Jervis so it would lead back to Hoboken. Here it is going into Otisville tunnel on the blocks of its train. Description: Blue Mountain & Reading 425 ran a couple of trips from Hoboken to Port Jervis the weekend of Aug 2 and 3 1986. This is the Aug 2 trip passing Tuxedo going away. 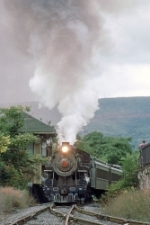 To facilitate turning the engine, a pair of M&E Alcos trailed the tool car, which cut off at Campbell Hall to turn the steamer and back it into Port Jervis. Description: The sign says everything! 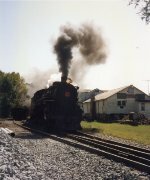 Description: RBMN 425 at Shoemakersville. Description: Ex Gulf, Mobile & Northern class G-1 Pacific. Note port hole(?) in the water tower. 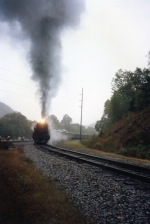 Description: Nice shot of the RBMN 4-6-2 Pacific under a canopy of trees while in Pennsburg, PA. Color slide by G.A. McKay. Description: Captured by G.A. McKay as its backing its way home with the tourist cars in a reverse direction pull is Reading, Blue Mountain & Northern 4-6-2 Pacific #425. Description: This shot is the best that I could get in this situation, unfortunately, as the crowding at the Grand Reopening of Steamtown was the largest that I had ever seen at a rail-related event up to that time, and still rivals anything that I've seen since. Even given that it was my best, I still ended up with a guy with a tripod. Notice that he's taking a video of a stationary object. Right.... I also had to crop this to hide a stain on the print that I scanned this from. Anyway, Reading, Blue Mountain, & Northern 425 is also visible in the background on the right.